Not sure what to get the pond enthusiast in your family? 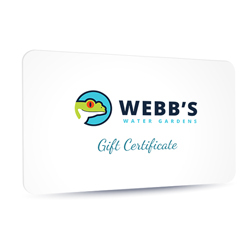 Everyone loves a gift certificate from Webb™s Water Gardens. Always the correct size and color. Gift Certificates can be used for any of the thousands of items we offer. Purchased Gift Certificates never expire. Gift Cards are delivered to you via email immediately following your order. Need a denomination other than those listed? We™re happy to provide any amount, just give us a call at 866-819-7663.